Restoration of creeks and fisheries is one of several project categories eligible for Prop 1 funding. The Water Quality, Supply, and Infrastructure Improvement Act of 2014 (Prop 1) was approved by voters in November 2014 (California Water Code (CWC) Division 26.7). Funding from Prop 1 is intended to fund projects that provide more reliable water supplies, restore important species and habitat, and develop a more resilient and sustainably managed water system (water supply, water quality, flood protection, and environment) that can better withstand environmental pressures in the coming decades. Chapter 6 of Proposition 1 requires the services of the California Conservation Corps or a local conservation corps certified by the California Conservation Corps be used, whenever feasible, for restoration and ecosystem protection projects. Corps programs increase the public benefit of these projects by creating workforce development opportunities for young adults. 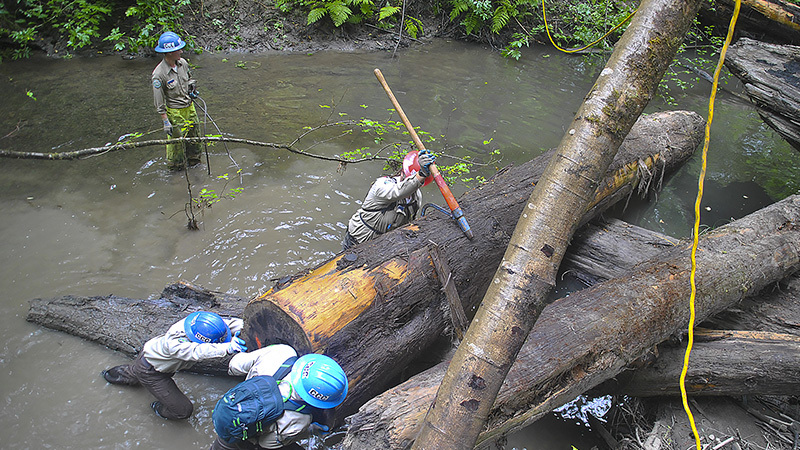 The CCC provides supervised crews of 10-15 young adults trained and equipped to work safely on a wide variety of environmental projects related to the priorities of Prop 1. Prior to submitting grant proposals for projects included in Chapter 6 of Proposition 1, grant program applicants must consult with the CCC and certified local conservation corps to determine the feasibility of the involvement of a corps program. Allow up to 5 business days for the project review and consultation process. For projects included in chapters other than Chapter 6 of Proposition 1, consultation with the California Conservation or a certified local conservation corps is encouraged. For more information, contact Andrea Gabriel at (916) 341-3272 or Prop1@ccc.ca.gov.